I’m used to shaking hands with people. I am used to giving hugs to family and I’m even getting comfortable hugging friends. I’ve seen the use of kissing the cheeks as a greeting and know it exists, but I’ve never actually participated in such a custom and I didn’t expect it in Austria. This is the land of shaking hands for everything after all. Shaking hands when arriving and leaving with pretty much every encounter, unless you are giving a hug instead. Nevertheless as you might expect by the pure fact that I’m posting something about kissing cheeks as a greeting, I have experienced this phenomenon a couple times since I’ve been here. To clarify a few things. They didn’t actually kiss my cheek. It’s more like they kiss the air next to my cheek while our heads are right next to each other. But it’s even more awkward to call it ‘kissing the air next to someone else’s cheek’. Although it seems to occur less often than shaking hands, it does seem to be an established custom that some people do. Especially since I’m in a cross-cultural psychology class right now and essentially participating in a cross-cultural experiment this entire semester by living in Vienna, the differing customs are quite intriguing to me (if at times bewildering or a bit uncomfortable) and I’ve started wondering whether this greeting custom can be correlated with people who are more comfortable with physical closeness overall or if it’s just the one specific greeting that they are used to. Ok, back to the story. Shaking hands, great! Hugs with people whom I know well, also great! Kisses on the cheeks by people I don’t know.. well, not as comfortable. We both say hi and introduce ourselves and then they lean in to kiss cheeks just as I’m about to stick out my hand for a handshake. Since this is their homeland and I’m just a visitor I tend to take cues from the other person and follow their lead in things like this. So I sort of lean in the bare amount possible and tilt my head one way and then the next all the while sort of stunned that they are actually performing this particular tradition and feeling very uncomfortable for many reasons. 1) I don’t know you and you are getting way to close. 2) I don’t really know what I’m supposed to do. 3) I was totally expecting just a handshake. As soon as we’ve switched sides, I stand back upright and take a small step backwards trying not to be rude, but feeling immediate relief from the re-establishment of my personal bubble. I can’t tell if they can sense my uneasiness, but I try to make basic conversation and ask questions until I finally find a topic we have in common and forget about the introductions. So I suppose this could be called one of those culture shock moments. An instance where I felt fairly awkward, unsure and uncomfortable and yet still tried to a certain degree to go with the flow. Encountering new customs happens on a regular basis here and I’m always learning more about the traditions and mannerisms and ways of doing things in Vienna, as they differ from in the US. So in a sense, this wasn’t so out of the ordinary, but rather quite in line with other experiences. In different varieties, I have instances like this one most days. They range from realizing that I need to speed up in the grocery store line and throw all my stuff back in the basket and bag at a table after I’ve paid to waiting for the teller to walk over to the produce section to weigh and price my bananas because I forgot that it’s not just done at the cashier to tipping a euro and a half and then being told that’s still way too much to then tipping nothing and feeling bad to getting stares in the underground because I’m having a conversation with a friend and it’s a bit above a whisper or automatically using the informal form of ‘you’ and then realizing I probably should have used the formal ‘you’ and then hesitating and taking a another multiple seconds while trying to figure out how to say the same thing using the formal ‘you’ instead. Each time I learn something new. Each time I am a little more prepared for the next encounter. Each time I feel like I can more seamlessly interact with the Viennese. There is no way I could have learned everything by being told it ahead of time. Some things are just better learned with experience and context. It’s something I’m valuing more and more the longer I’m here, along with the realization of how complex any culture is and how long it takes to learn all the subtleties. This includes language. I’m growing a better understanding all the time and yet continually find new things that surprise or stump me. That’s it for now. More updates and musings to come. Thanks for hanging in, here’s the rest of the story. I managed to not give in and although inside I was a whirlpool of emotions and nerves standing on end like electricity was flowing thru I managed to remember to look for the screens posting updated arrival and departure times for upcoming trains. Naturally, everything was written in Italian, which I don’t speak or really understand. Luckily I had picked up enough words or at least could recognize the difference between ‘arrival’ and ‘departure’ so that I could locate a train heading back the way I came. I needed to get back to the previous train station because from there I knew there was a train that could take me to the town I’d be staying at for the next two nights. I made it back to the previous train station-a much larger one with a steady flow of tourists-and found a train departing in about 10 minutes that would actually take me to my final destination. I was feeling better by this point, but my adrenaline was still high enough to keep my heart pounding a bit louder and faster than normal and I’m sure my shoulders were hiked-up a few centimeters further than usual. To top it off, I had to find some way to call the hostel I’d be staying at to make sure that someone would be there when I arrived later than the last check in time was stated as. Each country in Europe has it’s own phone service plans and although I tried turning off airplane mode and making a call anyhow, thinking that I’d maybe just be charged extra, it wouldn’t go though. I eventually turned on the wifi hotspot on my iPhone and managed to make the call to confirm someone would be at the reception when I arrived. In the end I managed to get to Riomaggiore, find my Hostel, check in and at the end of it all sit down to a delicious dinner at about 9pm (the towns, although small, had a charming night life). So it all worked. Eventually. And I learned that I could panic and still function. That I could still make the decisions I needed to make to get myself from the little isolated train station and to my hostel bed safely. You can’t always know how you’ll react in a stressful situation until you are in one and it was a great feeling, the next day, to realize that I could keep my head about me even while freaking out on the inside. I also learned to check and double check which train I was getting on to make sure it is the correct one and that it is always helpful to know some basic words (especially words correlated to public transit) when traveling in another country. 2) Traveling alone meant that I was more likely to interact with other travelers around me and I met some incredibly interesting people from all over the place, of all ages and traveling for all different reasons. Everybody had their own stories and often I gained a lot of tips for what to see or not to do in a particular place. Furthermore, it’s amazing to realize that a small gesture of kindness from a fellow traveler could totally make my day and caused me to be a bit more aware about how my actions might be affecting the people around me as well. 3) I also spent a lot of time not talking. When you are walking around a city or hiking along trails all day and you are by yourself, you either don’t talk or start talking to yourself-which admittedly, I did do sometimes…and then tried to imagine the responses of friends and family members. In any case, I found myself with an abundance of time for my mind to wander and contemplate and digest things and ruminate. Without the distractions of other people or my phone or computer I found that my mind had plenty to say all on it’s own and that it actually needed a lot of time to do any serious thinking and decision making about the more complex and emotional facets of my life. And then there were times it was allowed to just drifted peacefully. For instance, as I rested at the top of a steep climb, listening to the breeze thru the trees and the absence of any traffic noises. 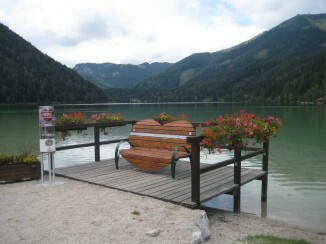 It was great to have time and space for myself: to think and to just relax. It’s not all fun and roses and sunshine and beautiful, helpful, nice people. Sometimes it is but sometimes it’s not. Because when you are on your own, all the planning and decision making, all the levelheadedness and innovative thinking needed to get yourself out of an unfortunate situation, all the successes and all the triumph when things work out as planned are all yours. My program has a weeklong break incorporated into the schedule, right after our three weeks of intensive German and before our regular semester-classes start. This was this past week. Given this long stretch of time, I decided to make use of it and head down to Italy, spending time in Rome, Florence and the Cinque Terra towns along the western coast. Not wanting to bother with finding a traveling buddy who just so happened to want to visit the same places I did or end up compromising on activities and destinations, I decided to travel solo. For transportation I used a combination of regional and long distance, overnight trains. Planning the trip took about four hours one afternoon, when I hammered out all the details as to when and where exactly I would be staying, along with my big transportation connections. And then of course, booking everything. After that I appreciated our childhood, parentally planned, family vacations much more. I couldn’t figure out a nice, continuous way to recount some of my strongest impressions and experiences about traveling alone, so I’m just going to list them in bullet point fashion. 1) There was one time when I took a train in the wrong direction. I was trying to get from Florence to Riomaggiore (small town on the coast) and it required one transfer. Just one. And my destination was supposed to be the first stop on the second train. 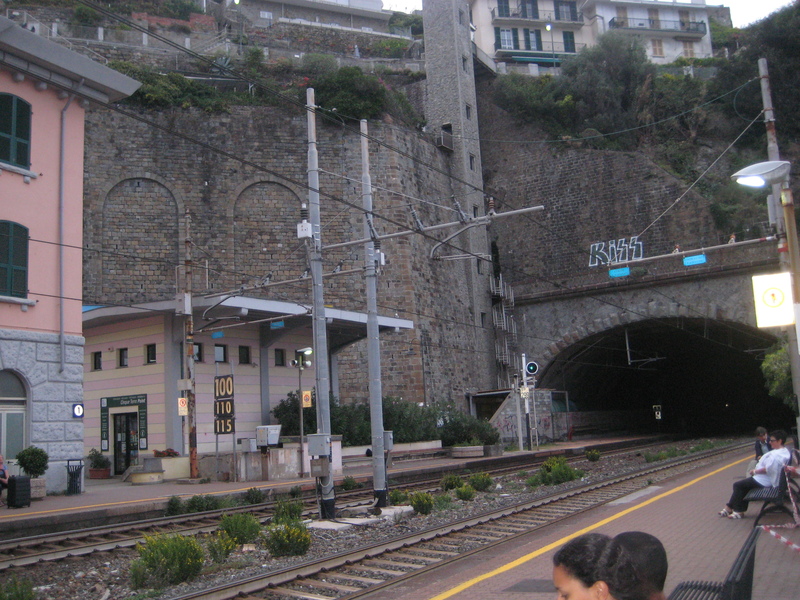 As we pulled into the first station and I saw the wrong name on the station signs I swung around to the Italian man next to me and tried to ask him whether this train went to Riomaggiore. After many hand gestures and repeating words and phrases, from both of us, I understood that this train was headed in the opposite direction. I then rushed off as soon as the train stopped completely and found myself at a small station in the middle of Italian countryside with the sun going down and closed windows on all information or help stands. As I looked around and took in my situation I found my heart pounding unnaturally fast inside my chest and panic rising, tempting me to overthrow all good judgment and run around screaming or curl up in a ball hoping it would all be just a bad dream. Second half of the story and the rest of my reflections coming soon ..
German intensive= 3 hours of German class a day, every weekday, for three weeks. The first three weeks here. No other classes. No English is allowed in the classroom. We discuss grammar to a large extent-refreshing our memories about all the wonderful particulars about the passive tense, and word order and the conjugations of each verb and which articles go with which nouns (there are three types and there is literally no system as to which article goes with each noun), plus their plural form. We also learn multiple pages of new vocabulary each day. Phrases, nouns, verbs, adjectives, etc. Flash cards have become my new best friends. That means I have hundreds of new friends. This is not an exaggeration since I buy them in packs of a hundred and have gone through perhaps five or more packs already. We also discuss the politics of Austria, history of Austria and Vienna, a bit about architecture concerning the buildings in Vienna and a few famous artists’ life and works. Of course this is where a large amount of our new vocabulary stems from, since there are specific words and phrases associated with each new theme. German intensive also includes field trips to listen to the Austrian Parliament in session (yes it’s in German and yes it’s very difficult to understand), the Rathaus and the Leopold museum. Plus, of course, a couple hours homework (readings, grammar worksheets, learning new vocab..) each night, plus tests at least once a week. The combination of so much new information about my environment and attempting to memorize and internalize hundreds of new words and phrases and grammatical rules and processing another language for a large portion of my day seems to require my brain to work in overdrive. This has given me an almost constant dull background throbbing in my head for the past two weeks. I can feel my brain protesting and sweating as I forcefully shove all this information into storage at an insane intensity. There comes a point when my brain finds even the most miniscule calculations or thought processes too much and my brain shuts down. I can’t focus on anything and anything that’s not a simple straightforward command just flies right over my head. It’s at this point that I decide I need to just get outside and walk around without interacting with anyone, maybe eat something (never knew working out your brain could use so much energy) and drink water. Of course it’s also extremely exhilarating to be able to watch my knowledge grow day-to-day, gaining a better and better understanding of the German language and Vienna. Reaching the extent of my brain’s capacity to soak in new information. Realizing suddenly one day that I said ‘going home’ and it meant my apartment in Vienna. Being able to recall the map of the U-Bahn system in my head and being able to get to and from the IES center while being completely absorbed in something other than directions. It truly is amazing to see how much I can learn and adjust to in such a short period of time. And now I am only more excited to see how the rest of the semester turns out. Time to learn new things, soak in new experiences, learn more about myself and give myself more headaches. Because it’s fun. Great fun.